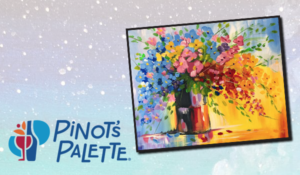 Take your pick from a list of exciting social events where you’ll mix and mingle while creating beautiful artwork at Pinot’s Palette in Danville. For your $10 off coupon, click here. 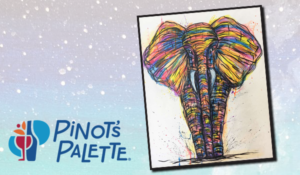 Join Pinot’s Palette in using impressionistic brush strokes and vibrant colors to form a beautiful, vivid elephant! Get in touch with your wild side and channel the elegant behemoth in multicolored fashion onto your canvas. 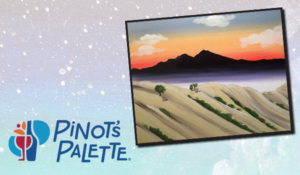 Even if you don’t wake in the shadow of Mount Diablo every morning, capture the beauty of an early morning on the bluff with this easy and fun landscape! Catch a glimpse of the full moon any day of the year with this night-sky scene. 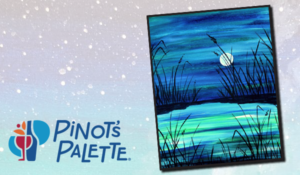 Create your own window to a calming starry evening and reflect on the good times had at Pinot’s Palette! 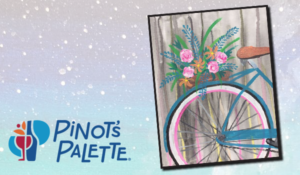 Wake up to a delivery of fresh flowers for you by bicycle every morning when you paint this lovely Spring scene! Don’t miss your chance to liven up any room with flora that never wilt while supporting a good cause. 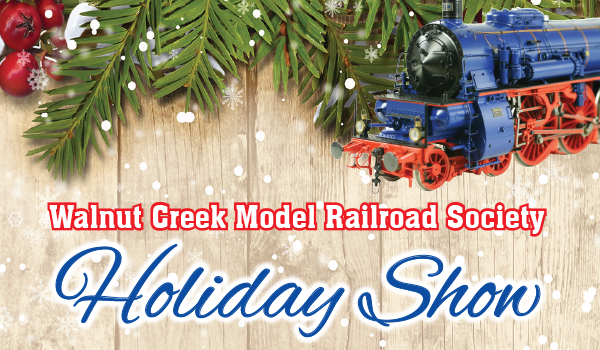 Proceeds from this event support Relay For Life-Tri City, Team Aloha ‘Oe Cancer. 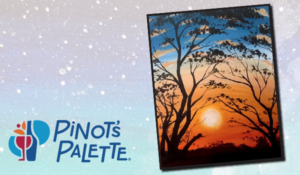 Skip the arduous hike, but head straight for the hills as sunset hits between the trees and paint this beautiful picture for you to enjoy all year long. 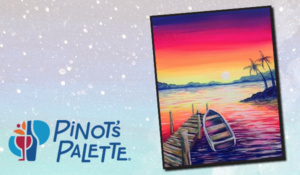 No acclimating to any conditions other than how to hold your wine glass while you brush, don’t miss a fun night of admiring the sky before the nighttime. 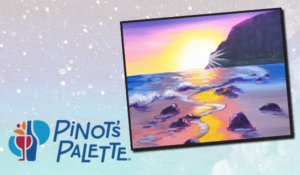 Grab a glimpse of paradise when you paint this lush Southern California beach sunset. 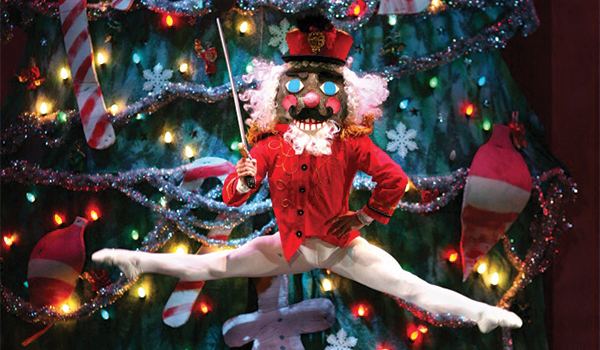 Don’t miss your chance to add a little radiance to your home with a night of casual fun. 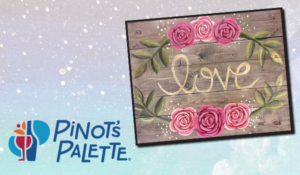 Turn a 16 by 20 inch wooden palette into the newest addition to your home, showing your “love” literally on the wall. Ditch the canvas and go straight brush to wood as you adorn this blank plank with your loving touch. Spring has sprung and Easter is here, the time for flowers, eggs and rabbits. 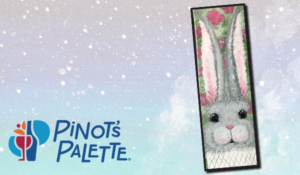 Join Pinot’s palette in honoring the Easter Bunny with this “ear-resistable” hare. Don’t be late this for this very important date! Sitting in the grass, or wading in the water of the blue lagoon, catching a glimpse of the moon through the reeds, and relaxing. 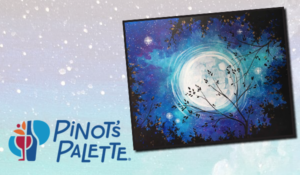 Create a wonderful world of calm night skies for you to enjoy at any point. Easter is here, brunch is over and the kids have their candy and eggs. 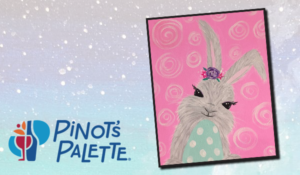 It’s time for you to get out and have a little “me” time, so join Pinot’s Palette in painting an adorable “Bella Bunny” to cap off a perfect holiday. April showers bring the May flowers, and those flowers are wet! 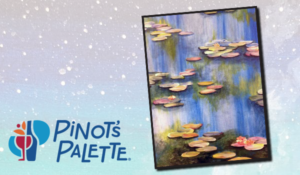 Dripping drops of paint down your beautiful flower painting add some character to your walls and make any room more interesting. Enjoy a private beach, warm sand and cool wind, hear the waves break and crash on the rocks, and let all the stress of the week melt away. 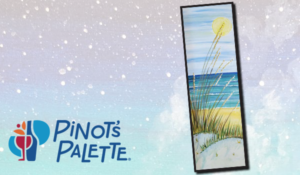 Then remind everyone in your home that cleanliness is next to godliness with this simple sign-on-a-beach scene. Find your secret getaway in this beautiful waterfall and wash away the stress and problems of the week. 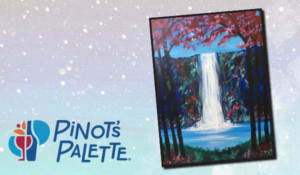 No tourists, traffic or loud noises in this secluded site, just you, your paintbrush and a nice glass of wine to sip on. 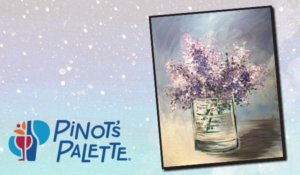 Inspired by Eduard Manet’s Lilacs in a Glass, this subtle, soft beauty can be in your home when you create your own at Pinot’s Palette. A cool, calming still life for any home or gift, ready for any season. Otis Redding would be proud to watch the tides roll away from this dock on the bay. Add a beautiful sunset to your home for any time, and rest your bones while reminiscing on simple times. 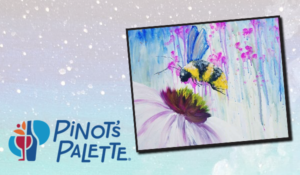 Cue “Flight of the Bumble Bee,” and follow the majestic pollinator to its wonderfully colorful, floral destination. Bring some brightness into the house with a snapshot of one of the Earth’s most essential insects doing its job. When we need the rain it doesn’t come around, but when it does it seems to always be too much. Customize this cute, contemplative kitty to look like yours or any kind you’d wish, and tailor the house to your windowsill or your dream home. Sign-up to support Team Aloha ‘Oe Cancer in the Relay For Life-Tri City. Lay down your towel, kick off those shoes and prepare for complete relaxation. 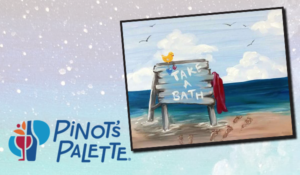 Escape to the sandy, sun-drenched anytime you want with this soothing project. Paint a portrait of your pet at Project Pet. 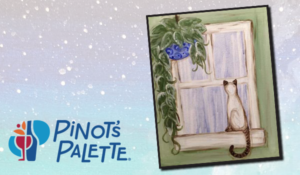 Once you sign up for the painting, email a high-quality digital photo of your pet to danville@pinotspalette.com and Pinot’s Palette will do the rest. Each photo will be transferred onto a 16” x 20” canvas. 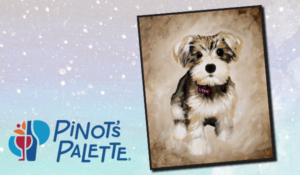 Pinot’s Palette’s talented artists will walk you through the steps to create your very own pet portrait! Registration closes and your photo is due by Friday, April 12th. No exceptions. If your picture is not received by the due date, you forfeit your seat. Please send a high-quality photo. One pet per canvas. The background of your photo may be cropped and your pet may be enlarged to fit the 16×20 canvas. 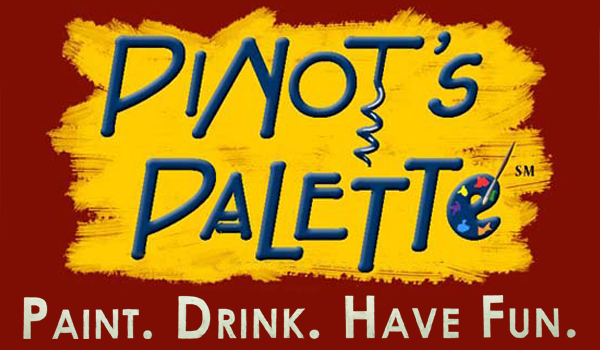 Email Pinot’s Palette with any special requests. Get all the feels of Claude Monet’s Giverny Garden in France while you recreate his beautiful lily pond shown in the early morning light. Don’t miss your chance to step into the shoes of one of the most revered painters of all time, the father of Impressionism. 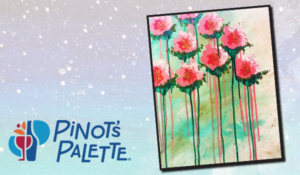 For more information or to register, call 925.743.9900 or visit PinotsPalette.com.